The compact, rugged, high-speed FTIR fuel analyzer — MINISCAN IR VISION — enables detailed and automatic measurement of diesel, gasoline, and jet fuels. The instrument has been configured to determine over 100 fuel parameters and components for quality inspection, for fuel blending, and for checking compliance with fuel specifications directly at the point of sale. Compound analysis is carried out in accordance with the international standards ASTM D5845 for oxygenates, EN 14078 for biodiesel blends, and ASTM D6277 and EN 238 for benzene. An integrated temperature-regulated density meter enables stability and accurate determination of fuel density. Fuel properties, including vapor pressure, distillation, and octane and cetane number, are automatically established from the full IR spectrum using PLS (partial least square) analysis and sophisticated chemometric models following ASTM E1655. Best prediction accuracy is achieved using several thousand data points. With regards to predicted properties, the MINISCAN IR VISION operates calibration data that need to conform to the stringent quality standards. 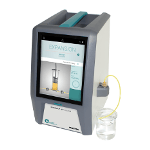 As a special feature, the instrument is integrated with a database of samples that have been obtained and analyzed by SGS. The MINISCAN IR Vision is unrivaled in its class of portable fuel analyzers. 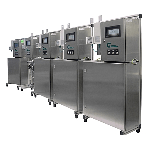 For instance, the thermoelectric temperature regulation of the instrument’s measuring cells, built-in density meter, and filling system maximizes accuracy when it comes to determining mass and volume percent of fuel compounds. Thanks to its durability, the instrument is suitable for the difficulties faced during mobile or field testing. The MINISCAN IR Vision integrates Grabner´s robust and proven bubble-free metal filling system. The shock- and vibration-tested Vision platform housing protects the instrument. The double interferometer is placed with a self-aligning mirror system, enabling automatic correction of intensity shifts following a rough drive over a bumpy road. Ease of use and the highest visibility are ensured by a rugged, 10” full-color industrial touchscreen even under harsh environmental conditions. The instrument can be operated with a 12 V car adapter for field use. 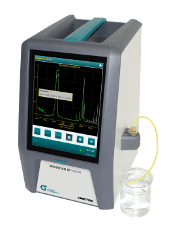 Specialized models for diesel or gasoline analysis are available. The pro model includes all—that is, diesel, gasoline¸ and jet fuel analysis. Dedicated models can be easily upgraded to a professional model.